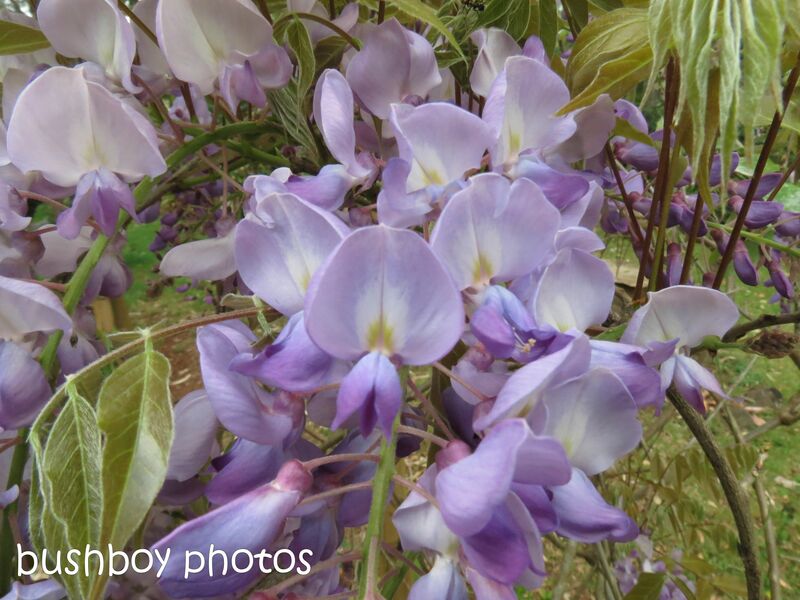 Check out Debbies Purple – click on the above link – It is stunning and I was thinking what do I have that’s purple to be able to contribute to this photo challenge. 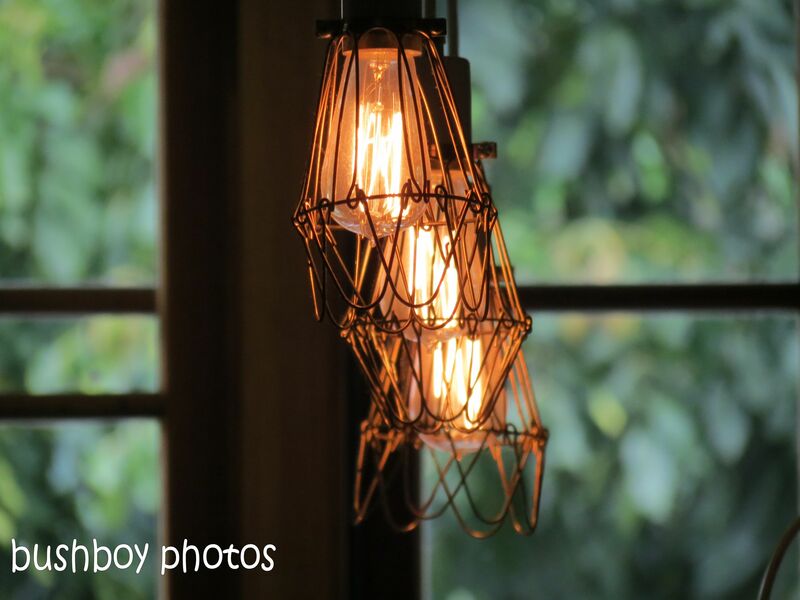 There is no way I can do wonderful lights like Debbies post. But I do live in a city which just had it’s Jacaranda Festival and has Jacaranda trees. But I wanted more so it’s floral all the way. 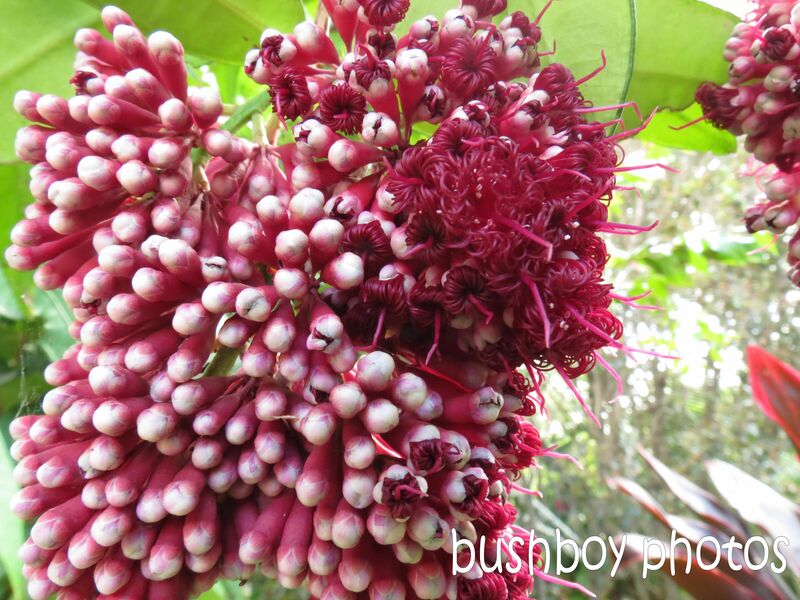 Another Native flower from my place. Haven’t identified it as yet. Let’s start with things. I don’t know what to call this bunch of photos as they are different. Enough talk. Off we go! I found these gelatinous blobs on the beach, hundreds of them. Perhaps baby jelly fish? The planes have been showing themselves a bit in October. Just love these rock cliff, the colours and again, can you see a face? The moss gave the tree a bit of a dress with a vine for dramatic effect. October saw the rain come. This dam, I use the water around the house and garden, was about one-eighth full. Seeing the water flow into the dam cured my blues. Waterfalls make such a soothing sound don’t you think? Even little waterfalls that help fill the waterhole. Fungi of all shapes and colours. Some big…. I love Grass Trees. These are at a place called Naughtons Gap. 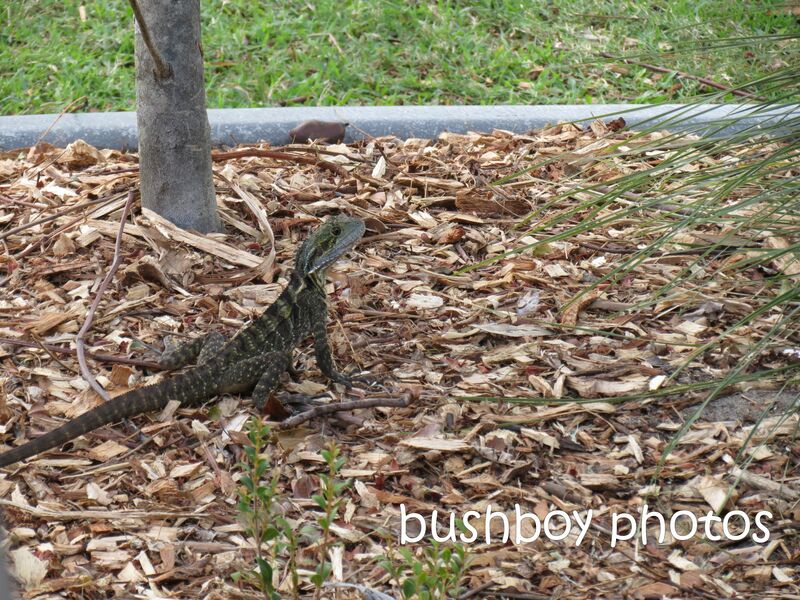 They are bigger than some of the Grass Trees on my place. A wonderful discovery was a whole street in Grafton lined with Bottle Trees. 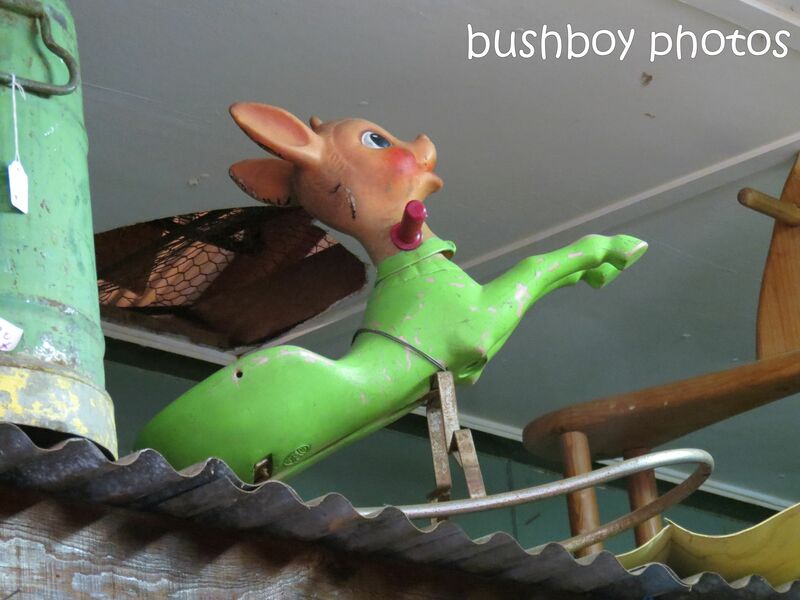 This will be investigated as to why and how and perhaps a bushboy post about the history of the Bottle Trees in Grafton may evolve. Sitting having a cup of tea with my bestie when a large Skink wandered about the garden. Wonderful markings aren’t they? Would you believe that this tree is called a Cheese Tree? Just an ant having a swim. He did get out eventually. The flower and a bee. The flower is on what is called a broad leaf weed which is supposed to be undesirable in a lawn. Look at the bees pollen sacks. I don’t think the bee would be as happy if the “weed” wasn’t there. Think before you mow please. The Forest Kingfishers have arrived. The male looked about for anything that moved in the grass or the garden. The colours on his back are lovely. It’s a bit of a way down to get a drink. Another arrival in Spring are the Grey Shrike Thrush. They are in the trees around the garden and sing in the morning and in the afternoons. What a delight to have in my garden. The Pied Currawong didn’t mind a bit of rain. A Coucal Pheasant came for a visit and sat high in the Gum Tree. Later on, I think he was checking me out through the undergrowth. 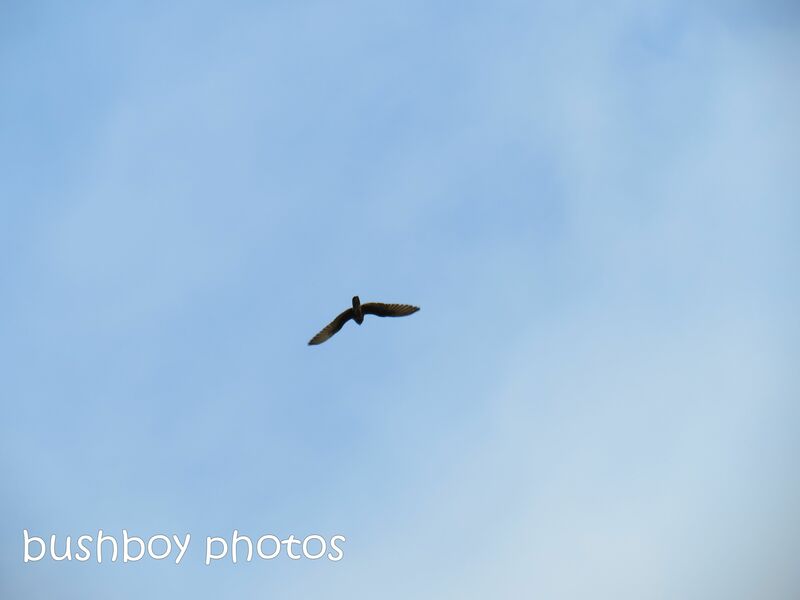 Remember the post about the Post where the Noisy Friar Bird was chased away by the Spangled Drongo. Here Rainbow Lorikeets get a serve from the Friar Bird. A bit of a peck to the head. The Rainbow Lorikeets were a bit bemused by all the carry on. A female Satin Bowerbird enjoyed the nectar in the Yamba Sunshine Grevillea. But like everyone else, the Honey Gem Grevillea is the best place to get a meal. Yellow-faced Honeyeaters seem to have a constant scowl on their faces. They are lovely as they hop up and down the trees looking for something to eat. Another photo from my office chair. I call this one, “I can see what you are doing” is what the King Parrot is saying. Out for a drive, we spotted a smallish bird run across the road and into a paddock. A new bird has been seen, an Australasian Pipit. Aren’t the males colours amazing? Yes, these “lovely” young birds had eaten half of the succulents in the pot. All around the pot, the succulent trailed over the edge. Can you see the bit trailing over the edge now. This hanging pot is no longer hanging where pesky King Parrots can get at it. This flower has caused great excitement for me. This is the first time I have seen a Hakea Florulenta on my property. Aren’t the tiny flowers delightful? Of course when it rains, you also find rainbows. This one had a faint double above. Did you have a favourite photo? Well here is the second installment of This is September. Here is an assortment of stuff but mainly nature. First off I’d like to let you know my sad news. My elderly neighbour and good friend Geoff, the bloke who gave me this beautiful Iris, died earlier this week. I have so many plants from his wonderful garden, perhaps a future blog, that I will always have good memories especially when the plants flower and spread sunshine to my garden. I might as well stay on the flowers that managed to bloom despite the lack of rain. Orange Trumpet flowers hang from the shed. The Pansys battled on with a watering every now and then. 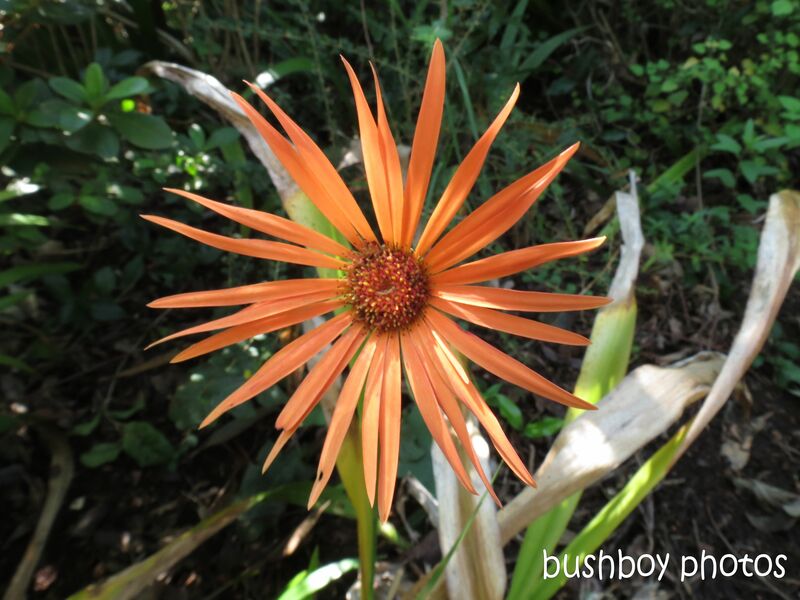 Stingless Native Bees were a buzz about the Orange Trumpet flowers. The Wisteria came out to bloom for a few weeks. Wanderer Butterflies were attracted to the flowers perfume. Another sign of Spring is Orchard Swallowtails in the garden. One of the biggest butterflies that come around the garden. On a walk we came across a Spotted Gum with interesting bark patterns and lumps. What can you see? The Ironbark looked like it had a claw emerging down its trunk. Can you see a cat? We saw a bear…can you? The sun is almost gone so it’s time to say see ya later. I thought I would join in on Beckys Photo Challenge. The idea is to post a flower a day in square format. 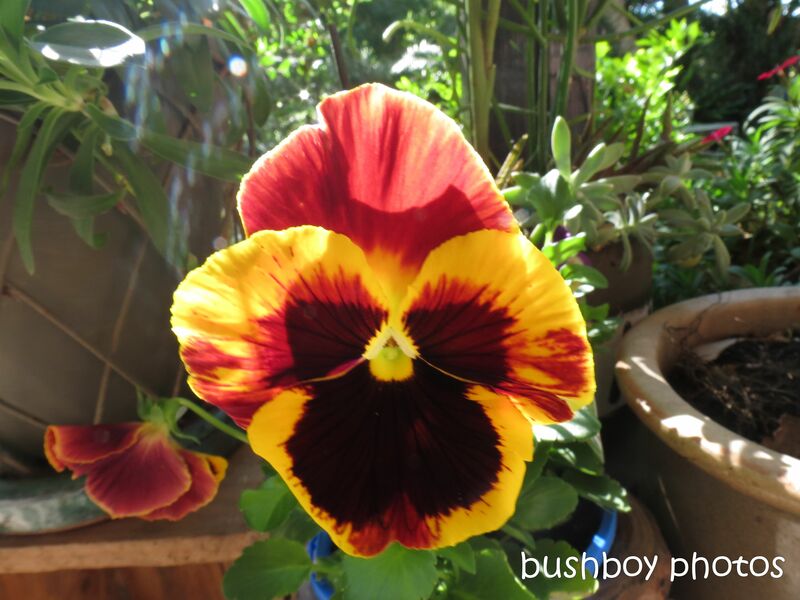 Don’t you think this Pansy looks a bit like a lion? I do seem to have a lot of favourite photos from August. I have done quite a hard cull. I hope you are able to get through all of this blog. It was a busier than usual month. The rain hasn’t come and the place is dry now. It is a pity the dam I use for around the garden leaked as it was full in Autumn and that would normally have seen me through Winter until the Spring storms arrive. Being so dry the number of birds are reduced but I have maintained the water points around the garden for the birds and animals. I almost feel like a bad parent, selecting the plants to water and hoping the others will hang in there until I start the pump and give the garden a good soaking. Enough of the sob story and let’s get started with the things I found in August. I just love the colour of this leaf. Driving about the property, mainly gathering firewood and pulling lantana out, I often come across a family of White-winged Choughs as they patrol the bush, walking about looking under leaves and bark for insects. It was good to see that this family group has grown from five to seven. 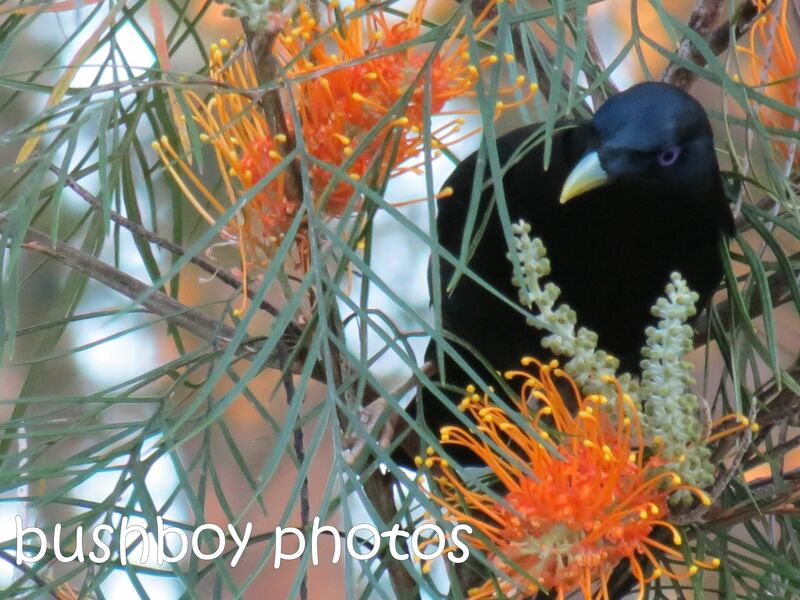 The wily Currawong was sitting in the Bottlebrush waiting for an unsuspecting small Honeyeater to drop in for a meal. At the small paddock dam, in reality a wetland now, the Peaceful Dove was walking down the slope heading for a drink. In one of the water points I have placed a stick so if a bird falls into the old drum, they have something to grab onto and get out. The Yellow-faced Honeyeaters like sitting on the stick after having a drink or plopping in the water for a bath. 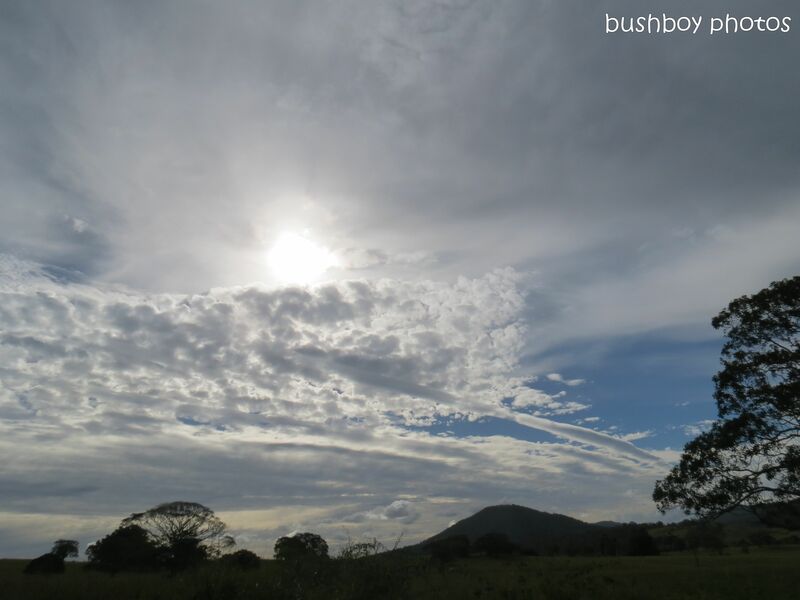 The main sounds that were echoing through the bush in August were the calls of the Yellow-faced Honeyeaters. They loved feasting on the Bottlebrushes. The Black-faced Cuckoo Shrike was surveying the scene at Modenville. One morning the Bowerbird was eating the grass for breakfast. It had quite a number of beak-fulls before it flew off. The Bowerbird looked stunning in the afternoon light. I love having King Parrots around. Their whistle resounds through the bush. A Restless Flycatcher dropped in for an afternoon. The Superb Fairy Wrens were bustling about the garden at Modenville hardly sitting long enough for a photo. The little Variegated Fairy Wren was very busy with his flock of females as they explored the garden at Binna Burra. I wondered what had happened to my beautiful blooms on my Cyclamen and then I saw the culprit. It is almost like the caterpillar has a straw in its mouth. I found this tiny “house” that an insect has constructed on the bark of a block of firewood I had cut. I have bought it home and hope to see what come out of this beautifully constructed nest. I found this beetle marching with purpose along a log. 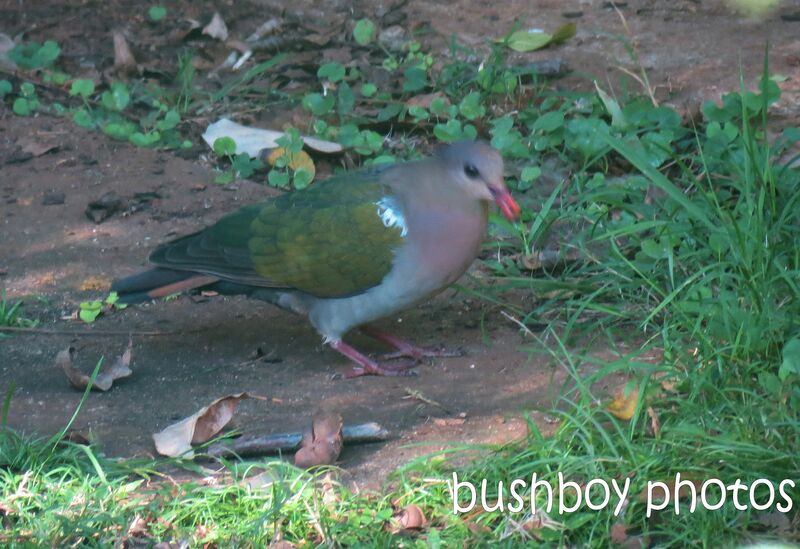 The Common Jezebals have been flying about the bush and garden for a few weeks. When they fly they have an intense stroboscopic pattern flashing of black and white. When the wings are flat you can see the predominately white side of the wings. I love it when there is an unexpected spider on a flower or seed head as well as small grasshoppers and ants. The seed head is about the size of a 20 cent piece. There is a lot of native flowers popping up this August. It was unseasonably very warm. A lovely circle of yellow flowers about the size of a 10 cent piece. I called this flower a Buttercup but it’s probably not. The leaves are similar to Oxalis. Look how hairy the leaves are and the flower has a lovely reddish brown centre. The Egg and Bacon plant is growing on the top of the dam wall. The flowers are beautiful and yes the leaves are spiky. A great place for small birds to escape into. I call this vine a Native Wisteria. It is also called False Sarsaparilla and a few other names. It looks lovely when the vine entwines with a wattle threading purple among the wattle flowers. Scattered throughout the bush these little star shaped flowers are easy to miss as they are about ten millimeters across. 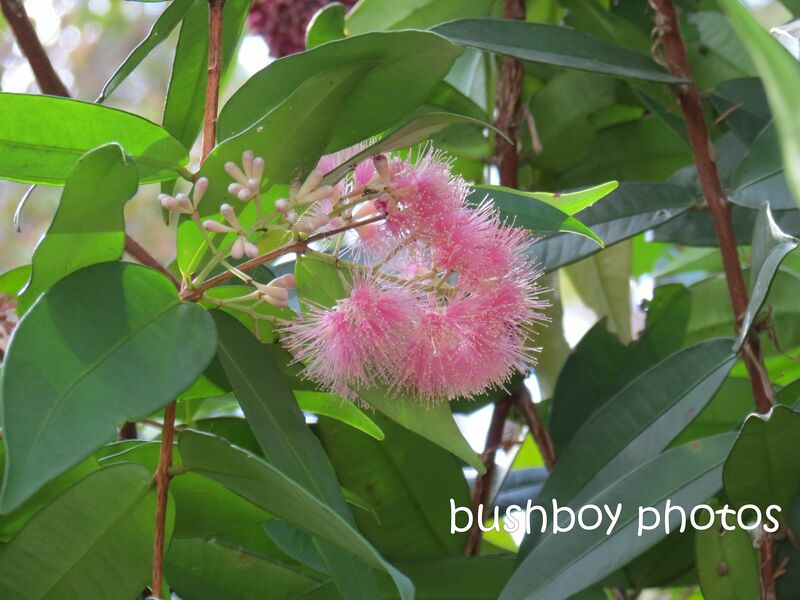 The Bottlebrush flower is photo-bombed by a Stingless Native Bee. This Grevillea flower is called Lemon Daze. Isn’t the inside of this flower interesting? Love the colour of these flowers. Pansys. Who doesn’t love smiling Pansy faces. The colours are spectacular. One August afternoon the sunset was spectacular. I love the effect of the hills and trees on the horizon. One of my Canon Powershot camera setting is called “Creative”. It takes a number of photos with different setting. This one made the sun look explosive. Looks like the sun has set so goodbye and thanks for stopping by. So many things have needed doing and my time has been spent doing the many Photo Challenges, which I seem to be obsessed with as they give the opportunity to showcase your photos and techniques and at the same time see what other bloggers from around the world are doing. I love showing my part of this world or some photos of my travels. I hope you have enjoyed these Photo Challenges as much as I have. OK……….on to my May. May is show time in my town. What I love (as many of you know) are chooks so I always go to the poultry pavilion when I go to the Grafton Show. Here are my favourites from the show. Even the excitement of the Show doesn’t stop the need to lay an egg. 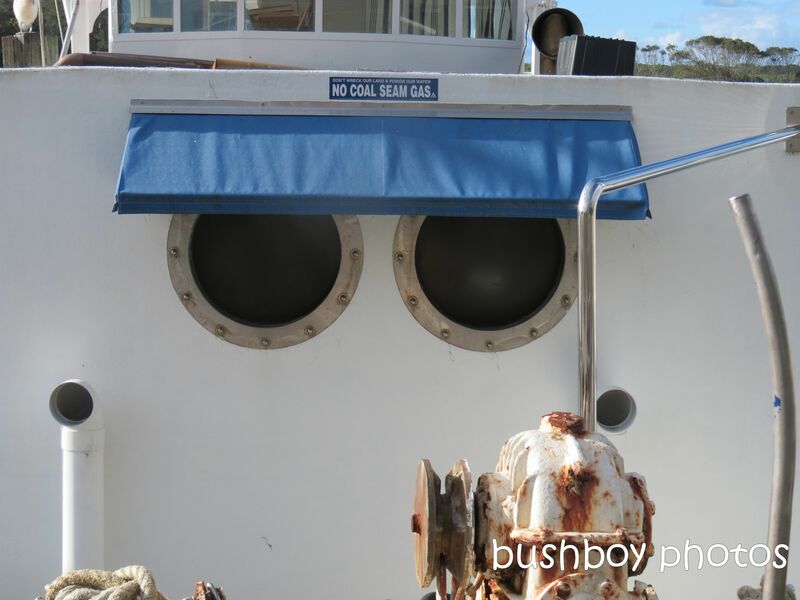 One of the Photo Challenges I did was Frames and the Currawong was the first image. This Currawong found the water well in the Poinsettia tree and was enjoying a drink. The Lewins Honeyeater has been a constant visitor in May to the verandah looking for insects and gathering spiders webs for the nest. I think I was spotted as he looked in the door from the Zygote Cactus. Another visitor to the garden at this time of year is the lovely little Rose Robin. I love this dark purple variety. Just sitting in a wheelbarrow garden looking fabulous. Some flowers look lovely at the end of Autumn don’t they? 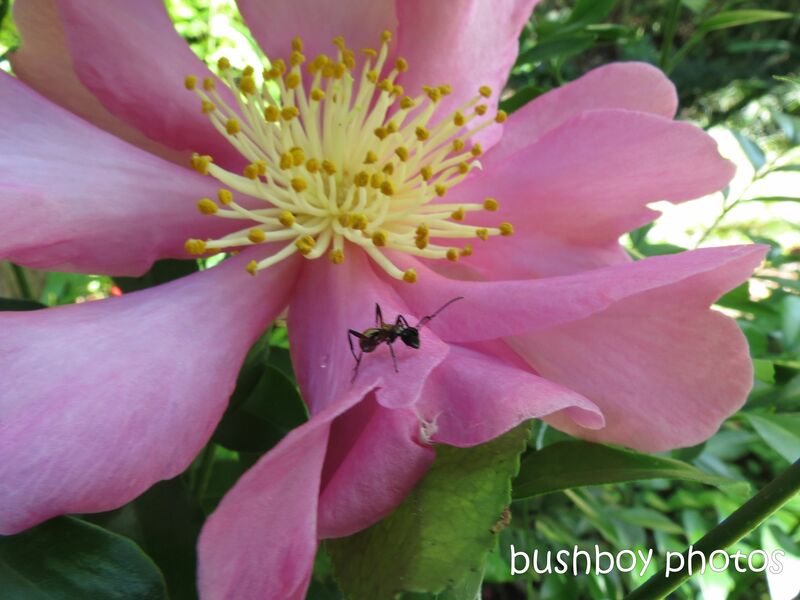 Sitting in a cafe in Brunswick Heads I spotted the Native Stingless Bees in the garden bed on the street. The spiders web have a certain magic in the morning light. One night, there was a banging on the window. We went outside to see what was making all that racket. We found an Emperor Gum Moth sitting on the window sill. Aren’t the antennae wonderful? You know when Winter approaches when the insects wear their fur coats. The evening walk had wonderful lighting. I love this old fence with the air ferns and other plant life growing. The grass seed heads looked spectacular in the late afternoon light. I didn’t do any photo manipulation this is what they actually looked like. The Moon is almost setting the same time as the sun. 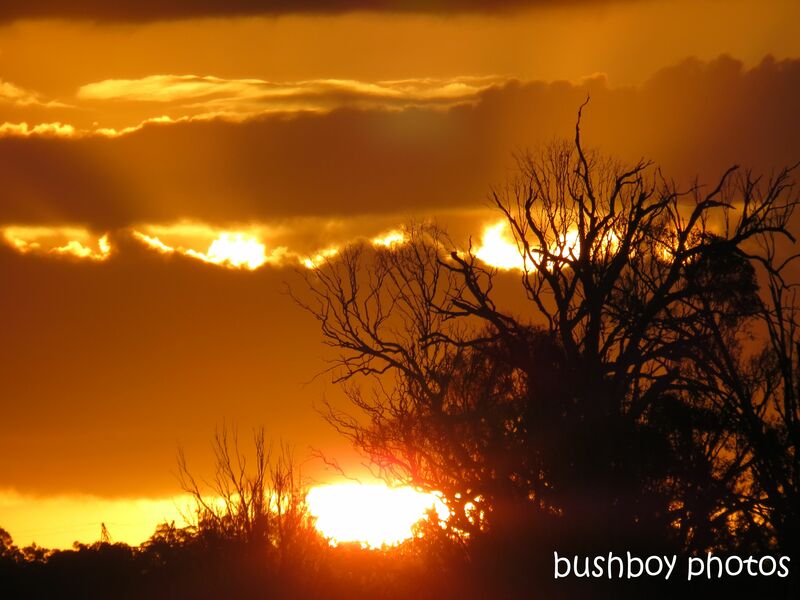 The Sun is setting so I better say good evening and hope you have enjoyed a little bit of May in my part of Australia. So much happened last weekend. Most of the things I found were during a drive to Murwillumbah plus bits and pieces around my besties place. There were things made of plastic, flowers, big things, small things and of course some birds. Lets begin with the first thing we saw on the road to Murwillumbah. Cruising through Mooball we just had to stop at the Moo Moo Cafe as the biggest motorbike I have ever seen was “parked” outside. As a bloke who loves his MotoGP and road racing since the days of the Yamaha TZ750’s, this one was worth a quick stop. Of course, the first stop was for coffee. This time we went to a cafe I hadn’t been to before. The inside was rather funky and we sat up the back so we could people watch and take in the feel of the place. I liked the lights. 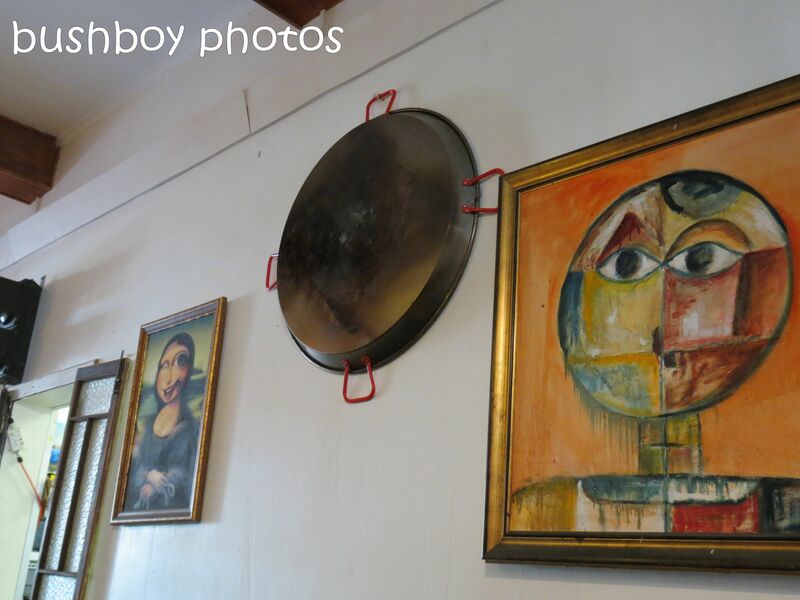 One wall had some wacky art works and the biggest paella pan I have ever seen. Of course the Op-shops had to be explored. 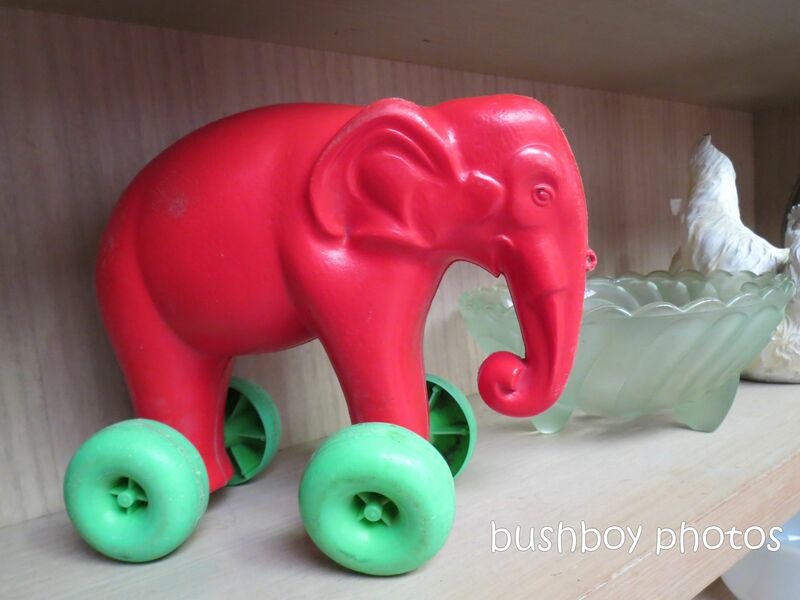 I found one of my favourites, an elephant. It was made of plastic but at $45 it stayed in the shop. So did the rocker. I think it was a deer? The Garden around the Civic Centre was bursting with flowers. The Lilli Pillis were lovely. 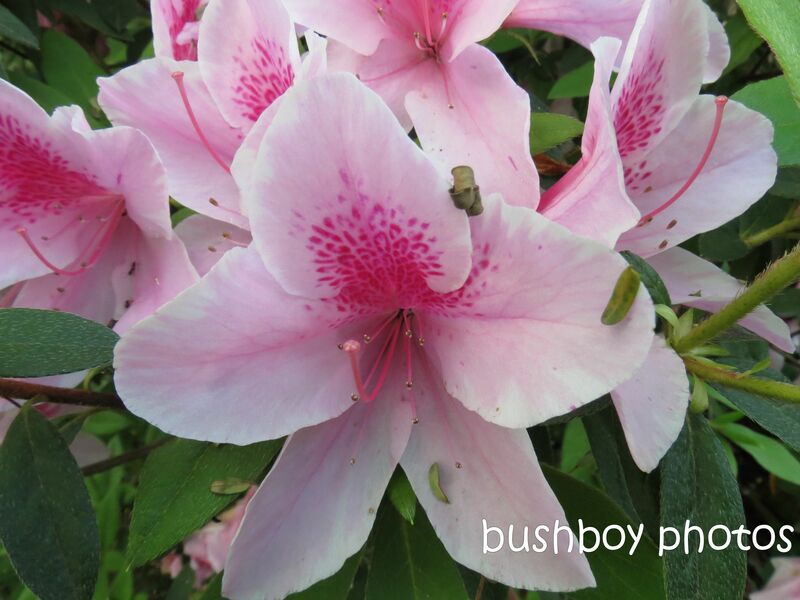 I think this is a Lilli Pilli too but not sure. Hanging around the garden was this little Water Dragon. He just ran every time I came near but stopped for a minute for me to get this shot before scurrying off again. 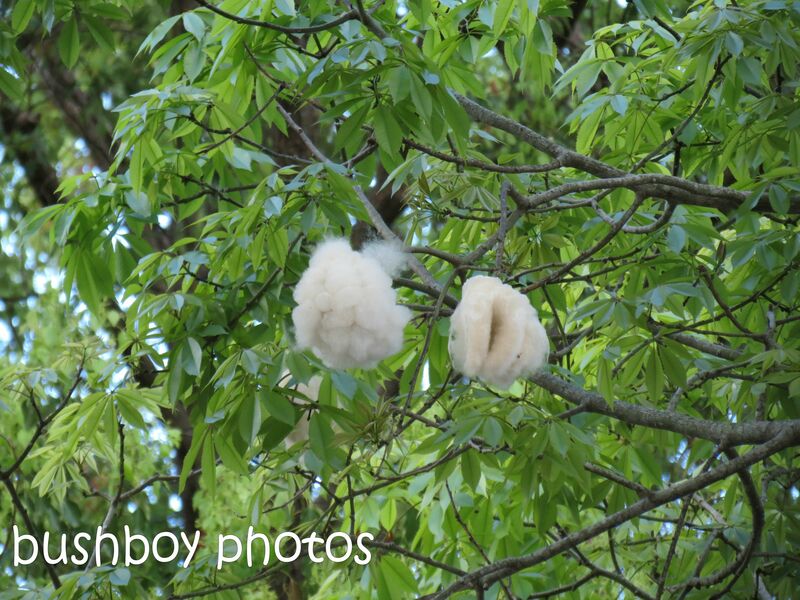 On the way to the Art Gallery is a Kapok tree whose seed pods were bursting open. The Tweed Art Gallery is always a stop off when there are new exhibits. Only one really took my imagination. The art of Philip Wolfhagen was the best and well worth a visit. 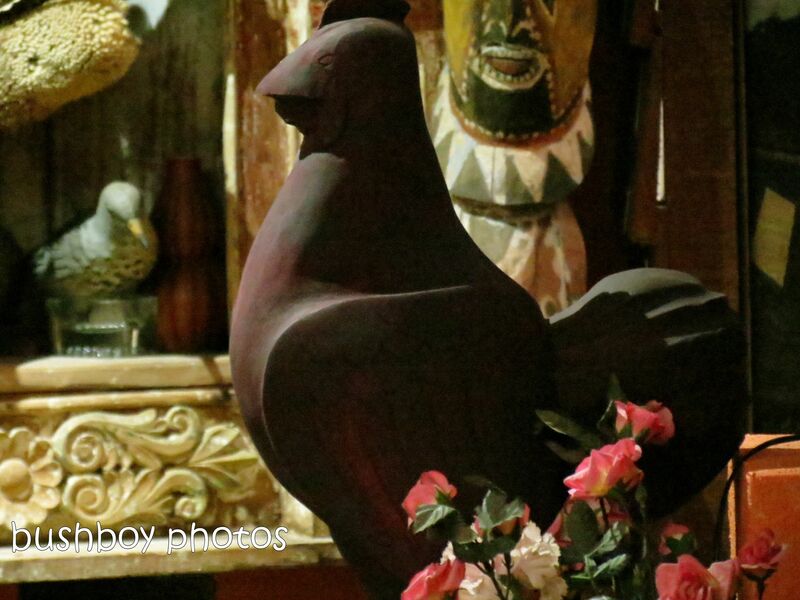 I just love the Margaret Olley Art Centre as I always find something that I hadn’t seen before. This time I found a chook. Okay, it may not be a chook but I want to think it is. 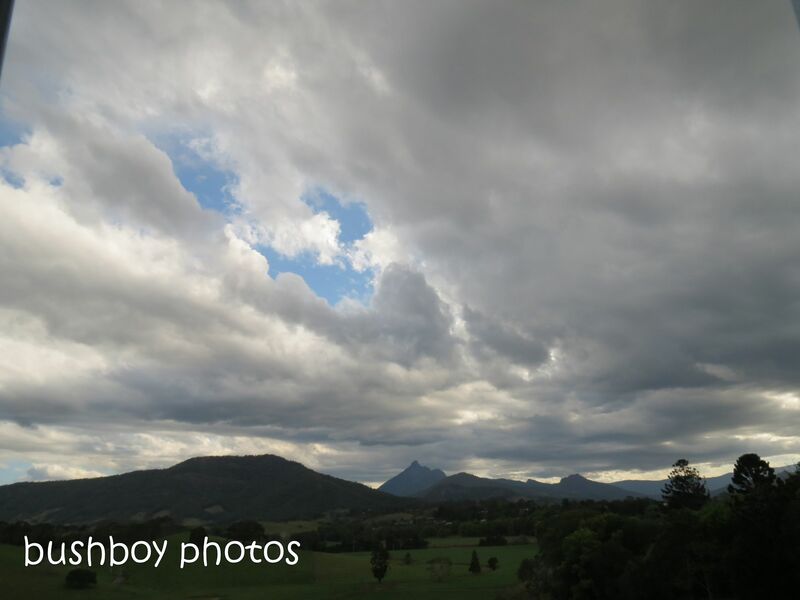 Looking out of the window we saw a storm heading over the range and over Mt Warning. They are always spectacular and dramatic looking. 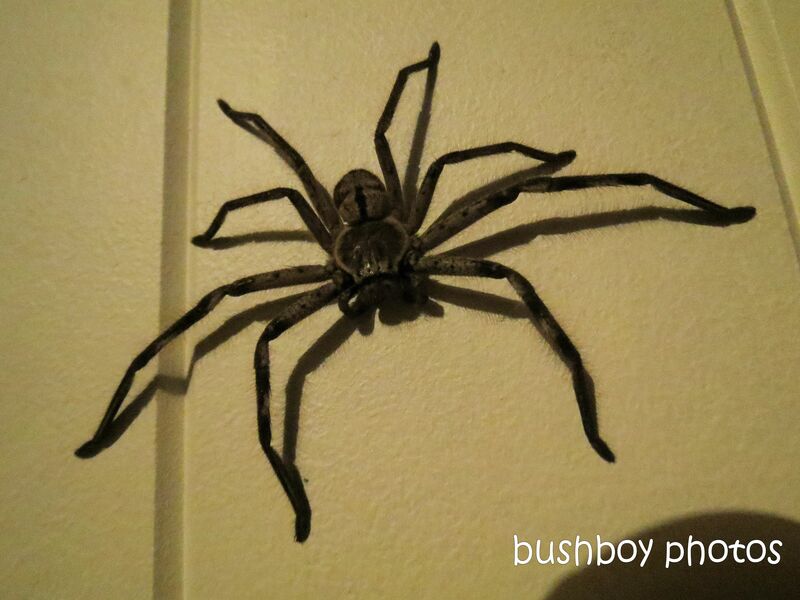 That night the Huntsman came out from behind the cupboard to check out what we were doing. The next day the overnight rain had refreshed the garden and it seemed that there were flowers everywhere. The scent in the air was from the Jasmin growing on the old fence around the garden. And from the Wisteria growing on the arbour. A splash of yellow caught my eye. 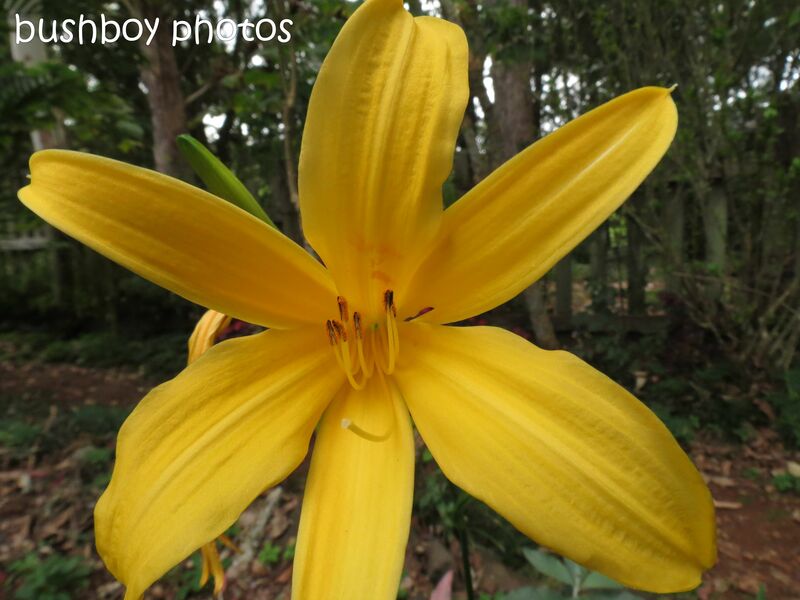 It was a Day Lily all by itself standing tall. The Azalias were full of blossoms. 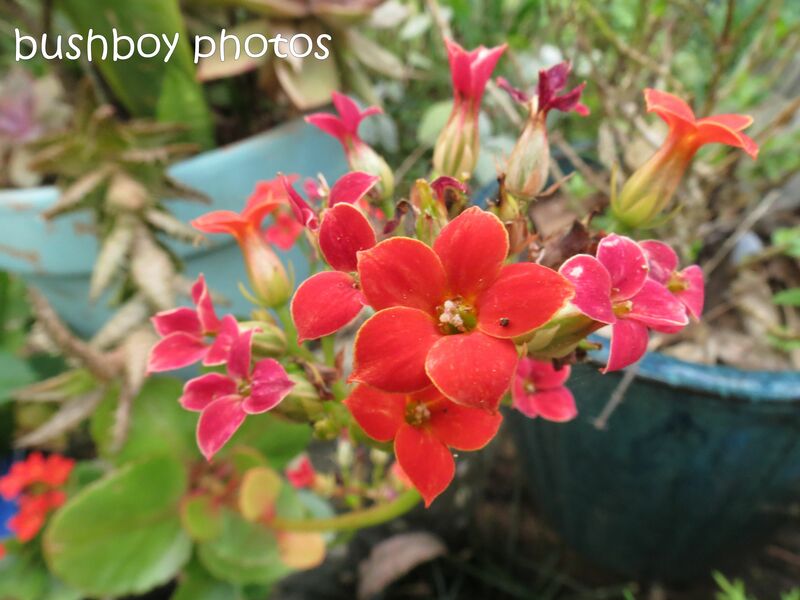 The red of these tiny flowers provided a contrast in the garden. There are Pansy’s everywhere, but these small ones looked a treat as they spilled over the edge of the garden. 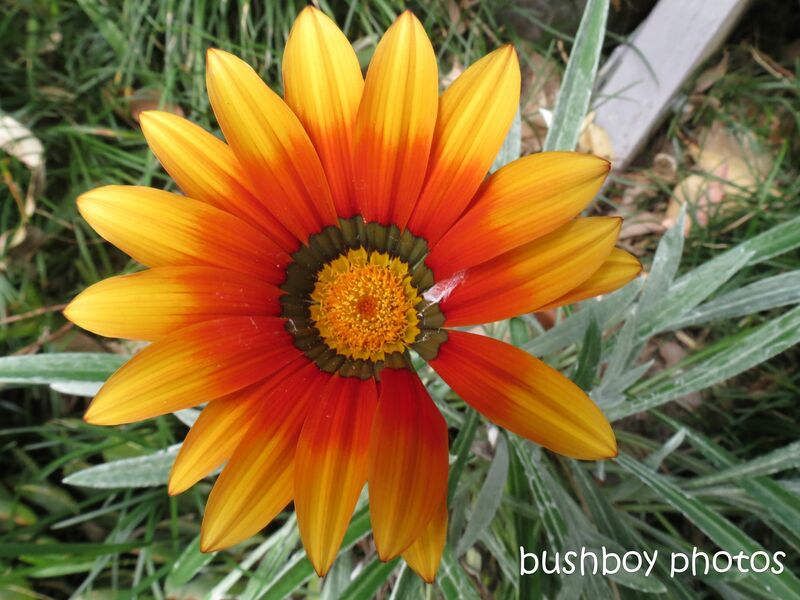 I disturbed a small spider who had folded the petals of a Gazania. He was gone in a flash, probably in case I thought he was a snack. High in the sky a couple of Kites wheeled about. They didn’t come down very close unfortunately. 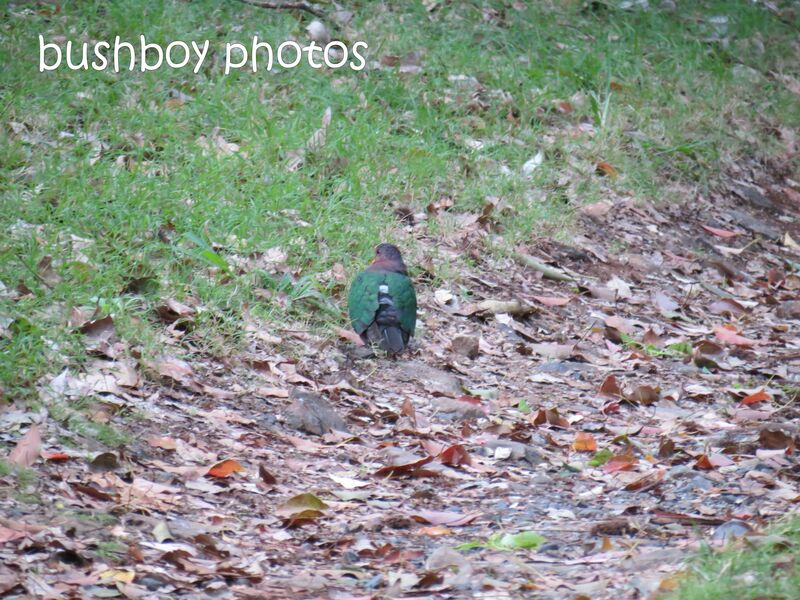 Walking around not caring about much, an Emerald Dove just walked down the track. While a Galah sat on the powerline looking rather fluffy. 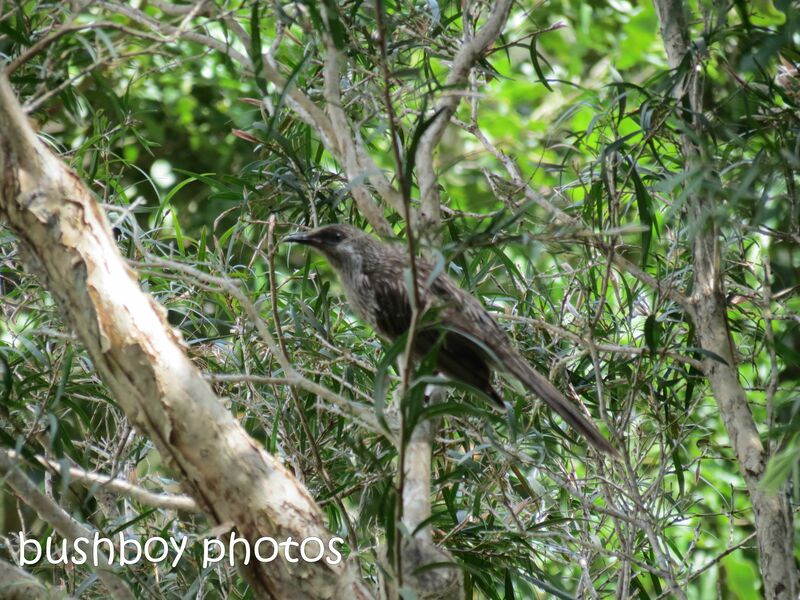 Among the bushes, a Brush Wattlebird was calling. 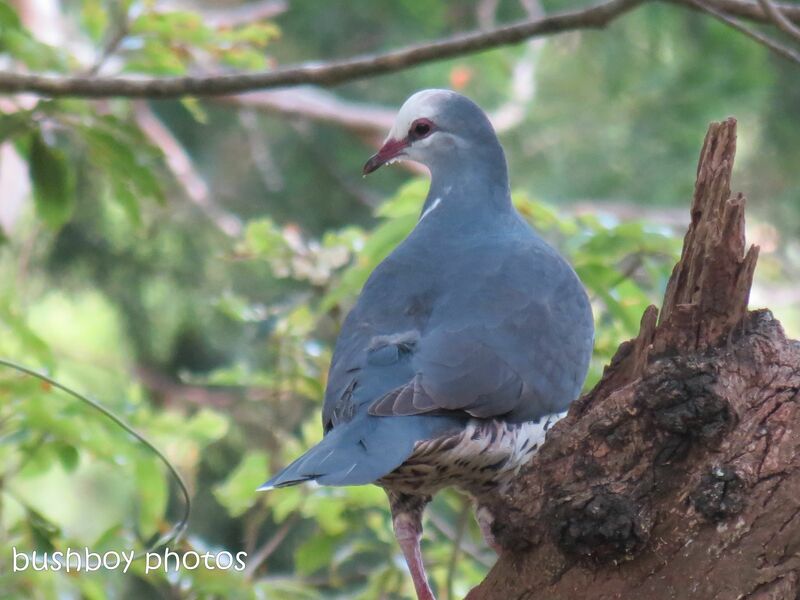 The Wonga Pigeon didn’t seem to mind the rasping call and sat around watching what was going on. 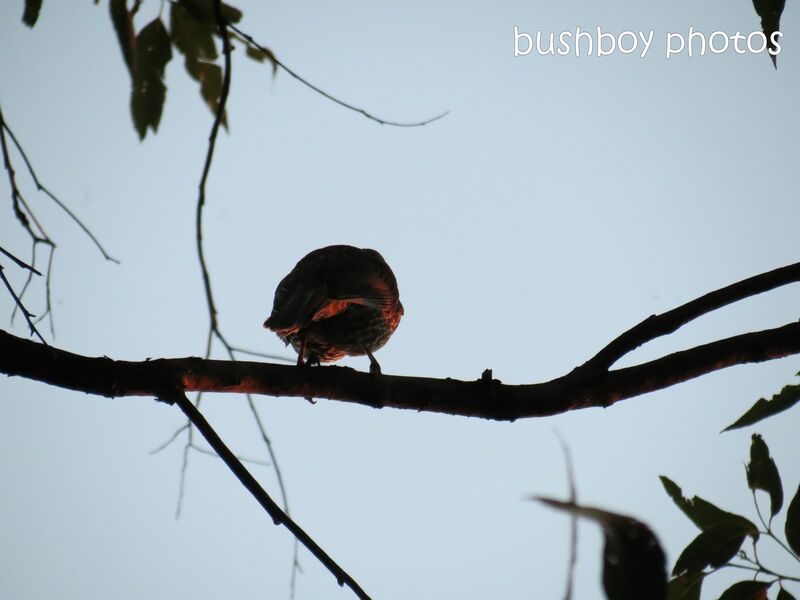 Late in the afternoon, it looked as if the wattlebird had its pants on fire. The next morning back at home, the Satin Bowerbird was getting into the Honey Gem before the Blue-faced Honeyeaters or Friarbirds were awake. This bloke did look rather serious didn’t he? 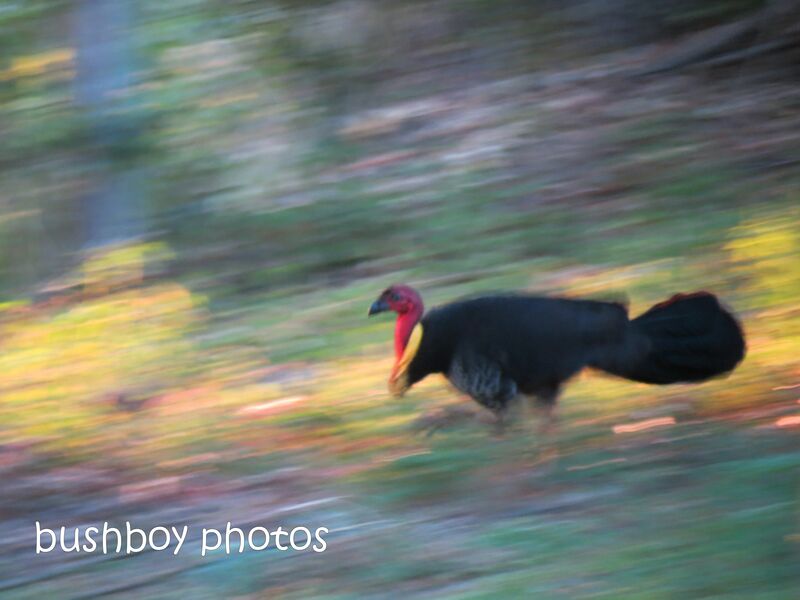 Well, like the Brush Turkey, I’d better run. I have ben slack I will admit. Here is a collage of life that I have found. Some have no meaning and just are stuff that the world leaves lying around, or sitting or just being. This wonderful farm-house, just sitting there, neglected. While overhead, the clouds were just blowing up and drifting apart, ever-changing. 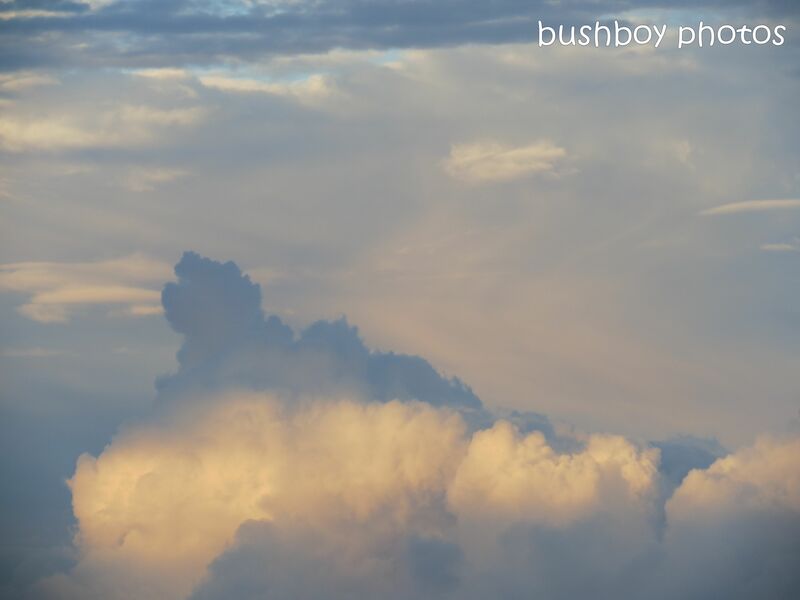 On the way back to Lismore, the clouds in the east had a soft blush of colour which turned to storm clouds. 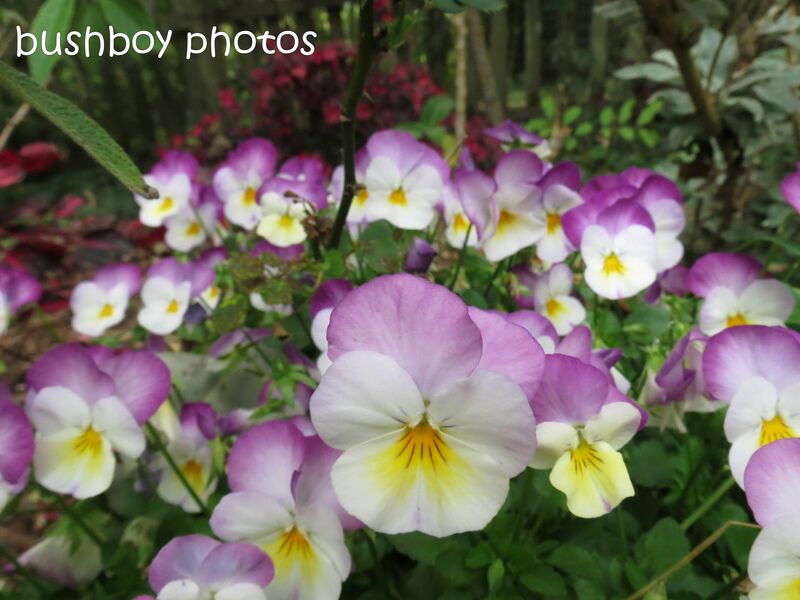 The pansies were blooming bright colours making spots of joy in the usually, almost colourless autumn gardens. 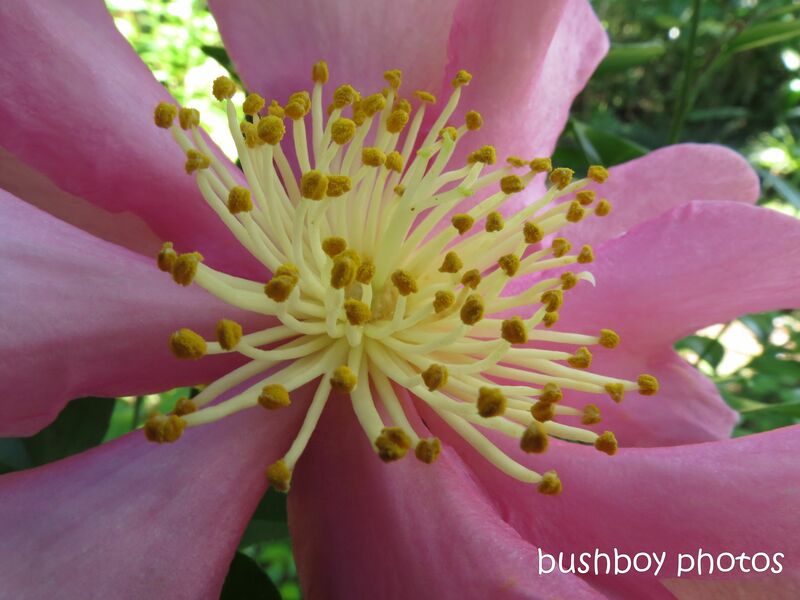 Everyone was enjoying the camellias, Lewins Honeyeaters were darting in and out and even the ants were traipsing all over the bush. Of course someone had to shine. The Gerbera was the star of the garden. The Emerald Dove can’t seem to stop still for a second. I think it scooped stuff up while strutting around the courtyard. The little Eastern Yellow Robin was always darting about the foliage of the tree begonias. 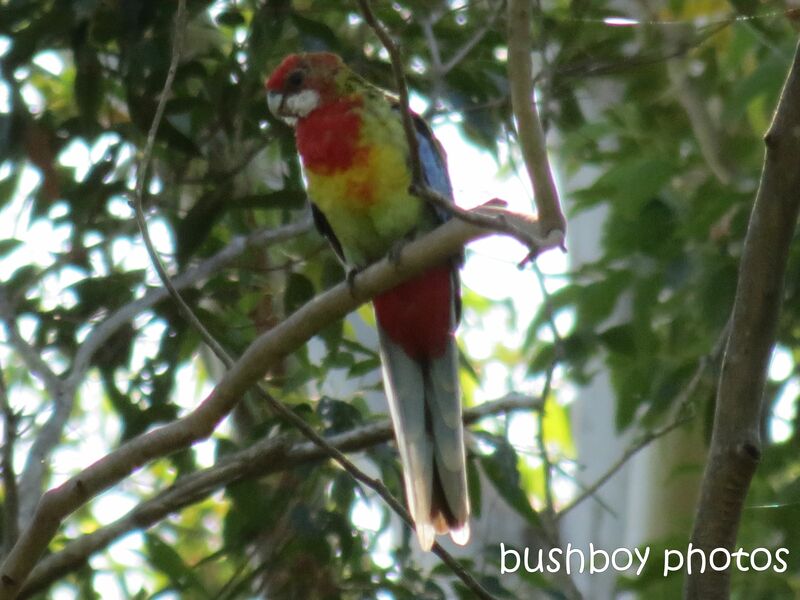 While overhead the Eastern Rosellas just chatted away, mostly to no-one in particular. 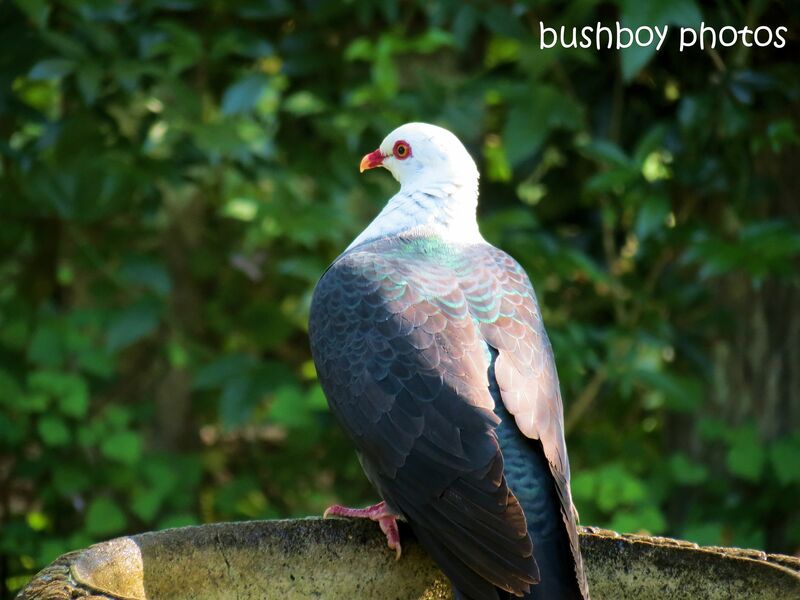 The White Headed Pigeon took advantage of the last afternoon to have a last dip at the bird bath. Up the flag pole!! 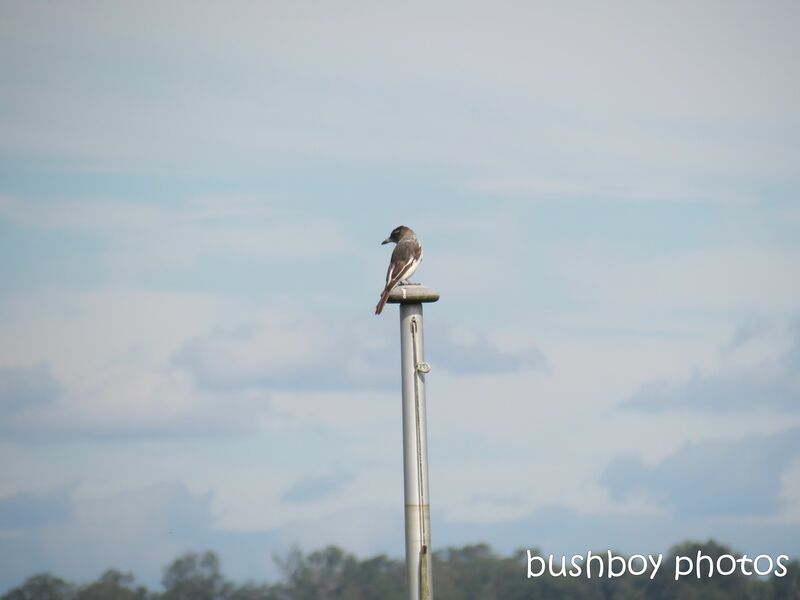 The Butcher Bird thought the flag pole was a great place to scan the neighbourhood. As long as he looked up as well. 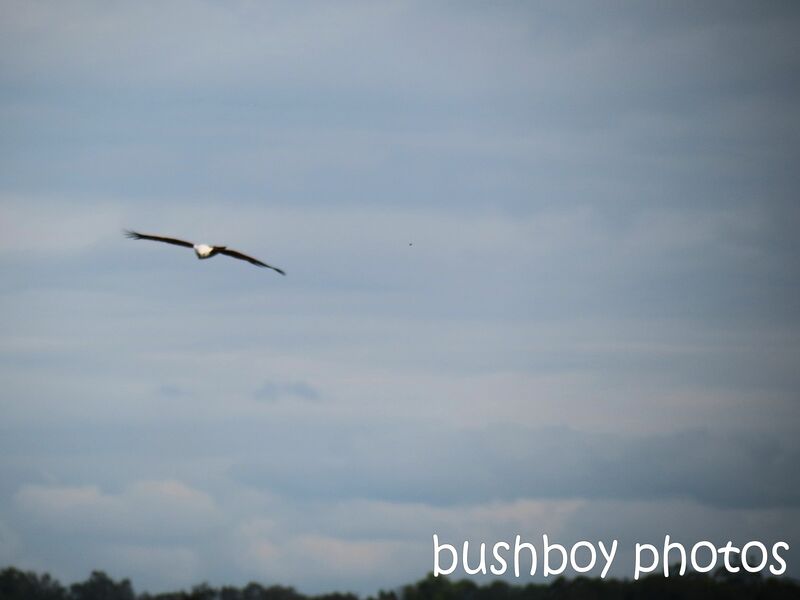 The Brahminy Kite was on the prowl making birds scatter everywhere. 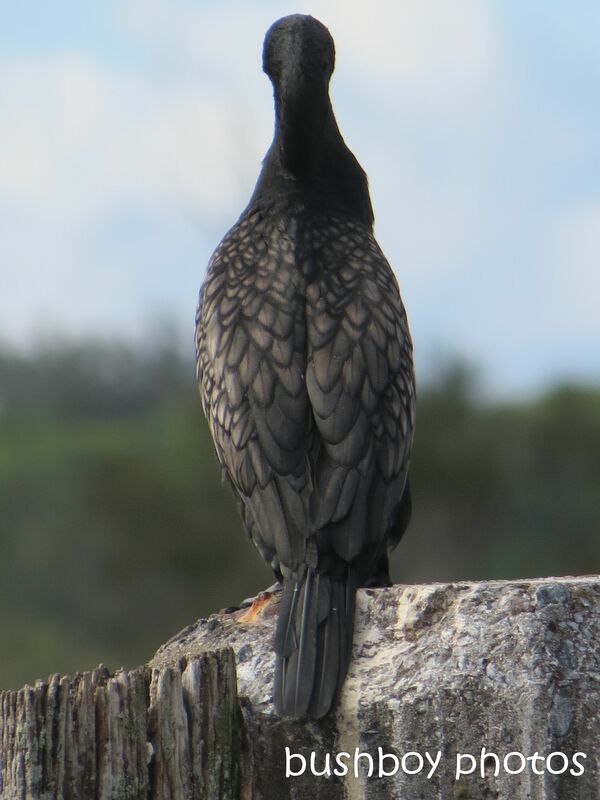 Cormorants look very pretty with their wings folded. All that drip-drying seems to pay off. 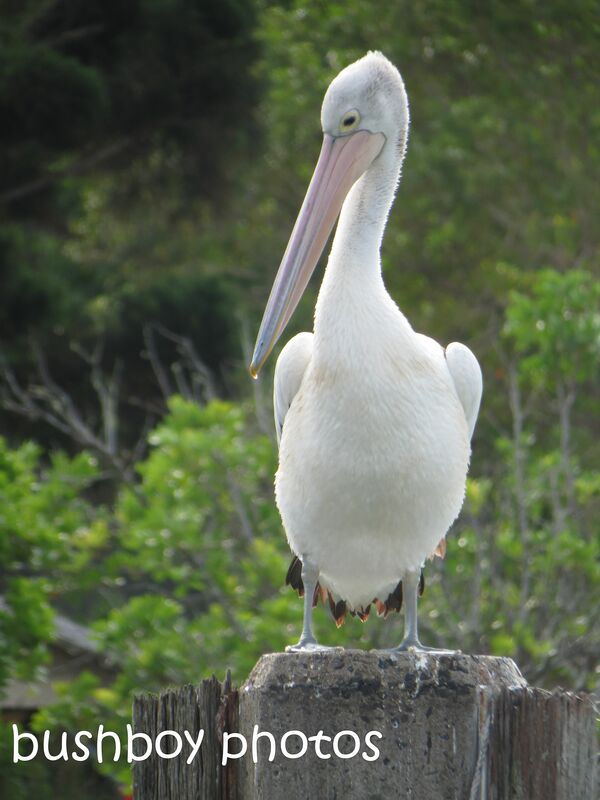 The Pelican didn’t seem to give a rats about anything. The Pied Oyster Catchers seemed unfazed by the Soldier Crabs who have just taken over whole of the little beach in a small bay. 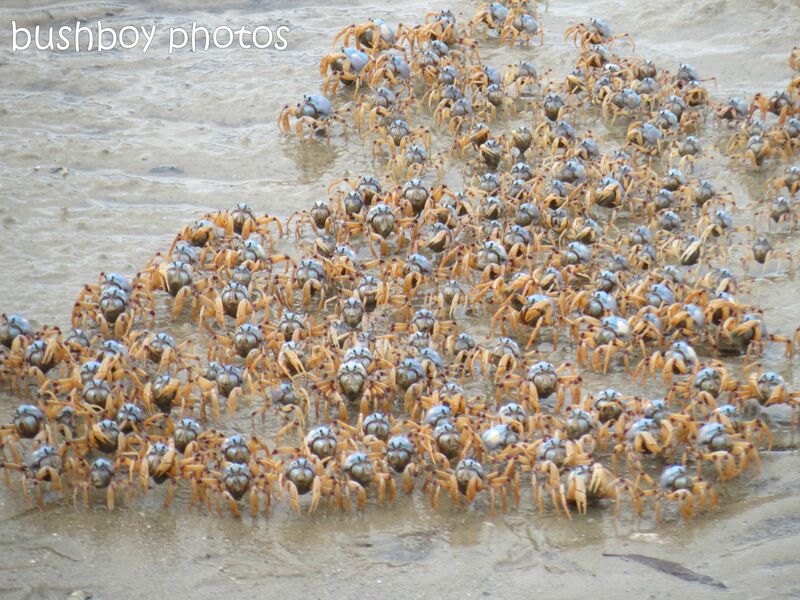 The Soldier Crabs were everywhere….always seemed to be on a mission to somewhere and back again, a bit of over there and a “Hey it’s Norm again” as business is done as a cluster ever moving, occaisionally stopping for a quick drink or to stuff a claw into their mouths possibly with a snack of some sort.. 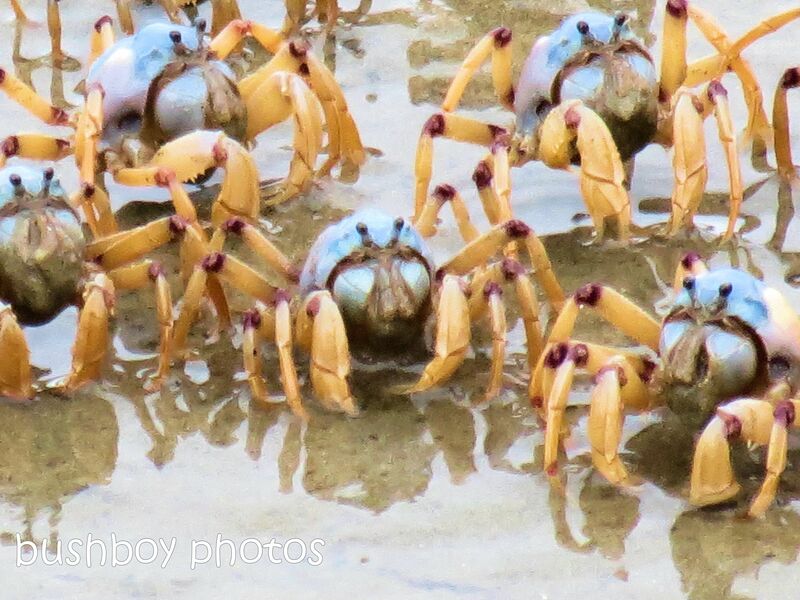 The crabs knew someone was looking on at their antics. No one was fooled by the shades. The end of the day. The sun setting like an explosion of fire and colour. The evil eyes are looking….beguiling you into the mouth of fire. 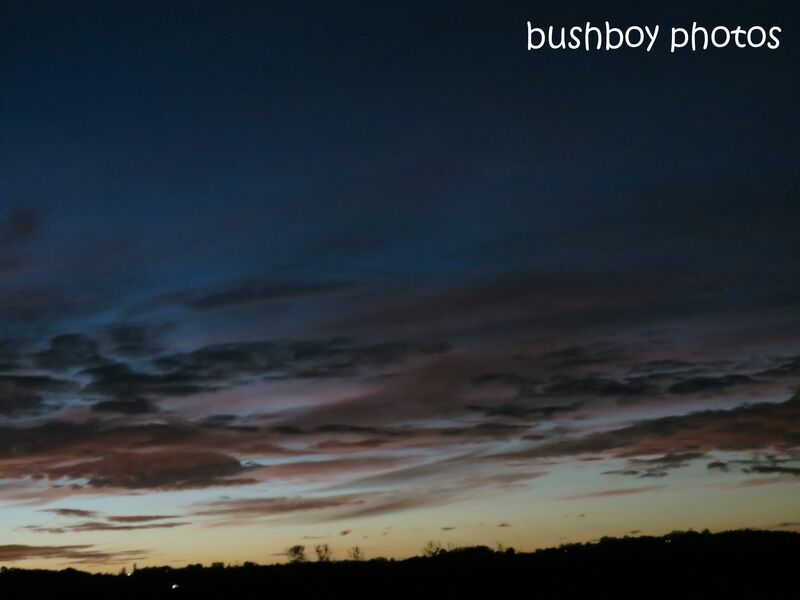 After the sun has set, it is sometimes just as beautiful. The purples, deep blues and almost a russet flow down into yellow with a lone house light in the distance. 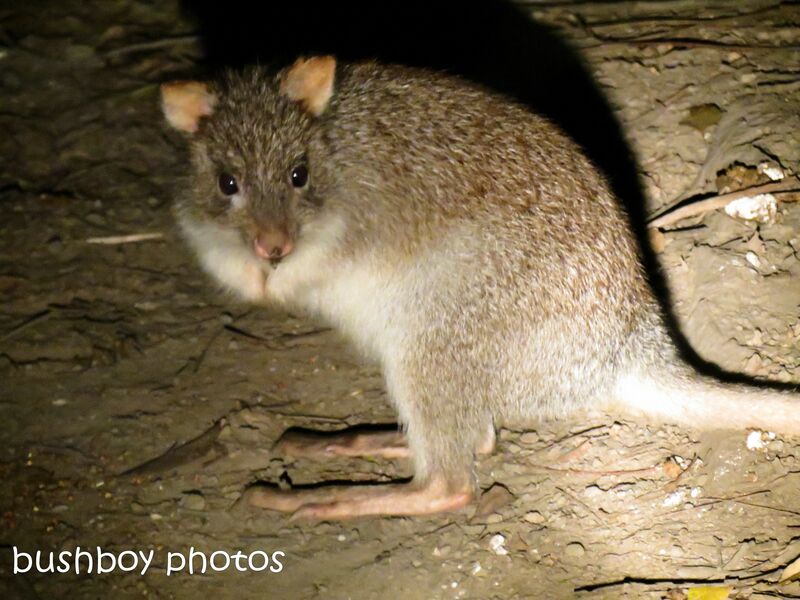 When darkness sets in, the little Pademelons come scrounging around the chook yard, hoping to snuffle up some grain the chooks left behind. That’s why this bloke has a smudge on his nose. 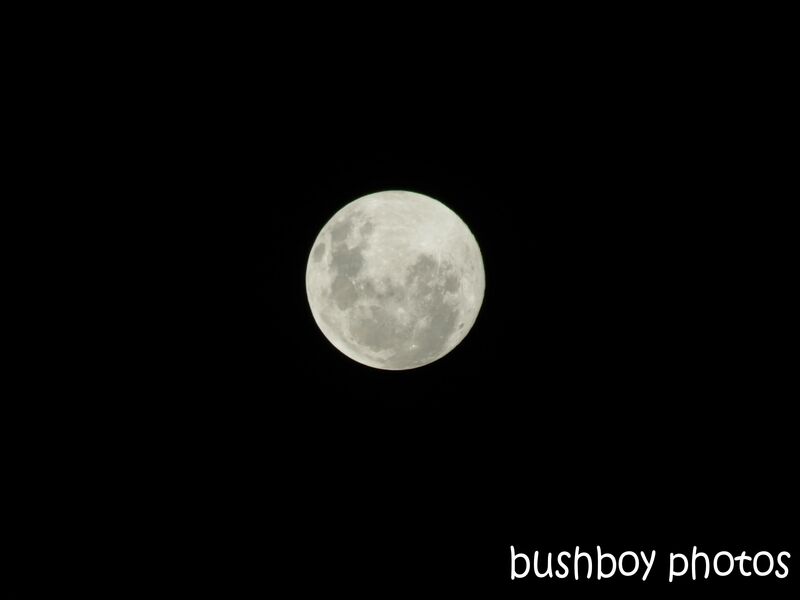 I love our Moon. Sometimes the Moon just shines when full. Goodnight.